Partly because of an expected shortage in certain ISBN categories, the International Organization for Standardization (ISO) decided to migrate to a thirteen-digit ISBN (ISBN-13). The process began 1 January 2005 and was planned to conclude 1 January 2007. 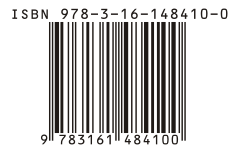 As of 2011[update], all the 13-digit ISBNs began with 978. As the 978 ISBN supply is exhausted, the 979 prefix was introduced. Part of the 979 prefix is reserved for use with the Musicland code for musical scores with an ISMN. The 10-digit ISMN codes differed visually as they began with an “M” letter; the bar code represents the “M” as a zero (0), and for checksum purposes it counted as a 3. 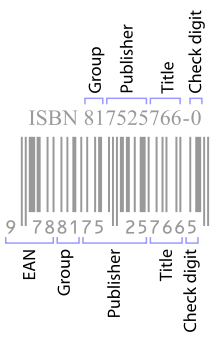 All ISMNs are now 13 digits commencing 979–0; 979–1 to 979–9 will be used by ISBN. ^ US ISBN Agency. “Bowker.com – Products”. Commerce.bowker.com. Retrieved 2015-06-11. ^ Lewoniewski, Włodzimierz; Węcel, Krzysztof; Abramowicz, Witold (2017-09-23). “Analysis of References Across Wikipedia Languages”. Communications in Computer and Information Science. 756: 561–573. doi:10.1007/978-3-319-67642-5_47. Retrieved 2019-01-13. ^ Canada, Library and Archives. “ISBN Canada”. www.bac-lac.gc.ca. Retrieved 2016-01-19. ^ “Bowker – ISBN”. Thorpe-Bowker. 5 Jan 2009. Retrieved 29 March 2012. ^ “ISBN Users’ Manual – 4. Structure of ISBN”. Isbn.org. Archived from the original on 22 May 2013. Retrieved 2013-05-27. ^ “The Myth of the eISBN Why Every eBook Edition Needs a Unique Number – Publishing services for self publishing authors and businesses”. Publishing services for self publishing authors and businesses. 2013-06-28. Retrieved 2017-01-16.